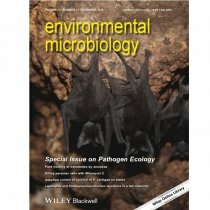 IDReC Dr David A Wilkinson, has made the front cover of the latest issue of Environmental Microbiology. 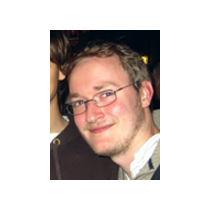 Research by one of IDReC's new postdoctoral researchers, Dr David A Wilkinson, has made the front cover of the latest issue of Environmental Microbiology. Together with other researchers from Reunion Island, in the Indian Ocean, he was looking at the dynamics of microbial infection within a bat maternity colony. 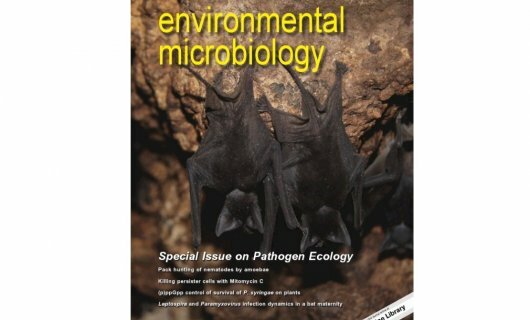 The front cover depicts two juvenile bats of the species Mormopterus francoismoutoui, a photo which was taken during field trips for this study. Figure 1: Front cover of this month's edition of Environmental Microbiology. "Bats are particularly interesting reservoirs of disease. We often cite the emergence of diseases such as Ebola, the henipaviruses or the coronaviruses SARS and MERS due to the tragic impact that these diseases have had on human populations and that, in one way or another, their emergence has been associated with bat reservoirs. The jury is still out as to whether bats are ‘worse' sources of disease than other wild animals such as rodents, and a number of hypotheses have been put forward as to why their physiologies, immune systems or behaviours may influence their ability to carry disease-causing microbes. However, there is no denying that these flying mammals are fascinating. Whether it be because of the wide range of ecological niches that they inhabit, the fact that they can live in huge groups or just the ‘spook factor' that you get from vampire bats or some of the weirder-looking old world bats. Figure 2: Seasonal dynamics of infections in a maternity colony of M. francoismoutoui. The continuous lines represent the proportion of PCR-positive samples for Leptospira (green) and paramyxovirus (purple), and the shaded area the 95% CI. Studying the bats in Reunion was absolutely amazing - M. francoismoutoui is a very small insectivorous bat that weighs approximately 5-6 grams, and is extremely common in La Reunion. During the breeding season, female bats group together in very large numbers (at one point we estimated nearly 150,000 individuals in the cave we were studying). As we did not want to disturb the colony, we collected urine samples under the bats as they would leave their roost to feed in the evenings, and used these samples to look for two different sorts of microbe - one bacterial and one viral. Our study showed that, despite the different nature of these microbes, the dynamics of infection followed nearly identical patterns over the studied period. This helps us to understand potential risk factors that may lead to spill-over and the emergence of disease, which in this instance seem to be directly linked to animal ecology."